Travel is all about human connection. It opens up worlds and minds and creates lasting bonds. Concept Farm has been the Strategic/Creative AOR for the Aruba Tourism Authority (ATA) since 2012. It’s been a long and fruitful partnership and Concept Farm has been a part of record-setting increases in visitation over the last 5 years. The ATA has also been named the #1 Digital Marketing destination in the Caribbean. Specifically, my role is as the lead relationship manager and co-creative director. Also, as Concept Farm produces all the creative content for Aruba, I am often the director for our shoots. Aruba is the #1 Tourism dependent island in the Caribbean, so making sure Aruba stands out in the “Caribbean Sea of Sameness” is imperative for the economic well-being of the island and its people. Travel is all about human connection. It opens up worlds and minds and creates lasting bonds. (This notion often gets lost as devices create more distance between actual human touch and interaction.) In a bold, deeply integrated way, we put the Aruban people front and center and shined the spotlight on them. And it’s not just about nice smiling faces in advertising. The campaign includes digital video, social, TV, print, OOH, ecrm, as well as integration into sales and trade efforts and native content with travel media partners. Aruba is famously known as “One happy island.” It’s been an island mantra and tagline for over 30 years. But as “experiential travel” becomes the new norm, people are looking to connect with a destination more deeply and really understand the culture. Respected studies from top travel brands show that experiencing a destination’s culture is the top driver of global travel. We looked to take the long-standing equity in One happy island and give it more meaning and depth. What does happiness in Aruba mean? Aruba is a very unique place, unlike any other in the world. Yes, it has incredible natural beauty, but most people don’t know that within the Aruban population of roughly 100,000, there are nearly 100 different nationalities all happily living together. All on an island 19 miles long by 6 miles wide! They are extremely open, diverse and connected. Aruban’s speak 5 languages and genuinely love to have people and share their home. The promise of One happy island really happens when visitor and local connect together. That’s where the magic happens. Aruba is a natural playground for visitors and locals to connect, play and laugh together. Can you share with us any alternative ideas (if any) for this campaign? Why was this idea chosen? Well, in the creative exploratory, we did have other ideas that were, essentially, more generically Caribbean. And when we put the “Authentic Aruba” strategic filter on the work, those campaign just fell off. And we’re glad they did! The client embraced it with open arms. And kudos to them for their bold choice. It’s not an easy decision to put yourself, your people out front in a big way. Their directive to their agencies is to “Be the most Innovative and Creative Destination Marketing and Management Organization in the Caribbean.” That set the bar high…and we love that. One of the greatest challenges was to make sure we were expressing the real emotion and beauty of the island without it feeling too “produced.” Our tactic was to hit it from three “angles” when producing: 1) Reality on the ground- in the moment footage of the Aruban’s daily lives. 2) Beauty from above – gorgeous stunning drone footage. 3) Storyline in the center- The thread and narrative that holds it all together. I’d say the most rewarding part of the process was working side by side with the friendly and talented Aruban people in making the campaign. Having them tell their stories and express their love for their home. Over 100 Arubans were involved in the campaign and not just in front of the camera…Our local crew included producers, camera people, sound, drone operators, wardrobe, etc. 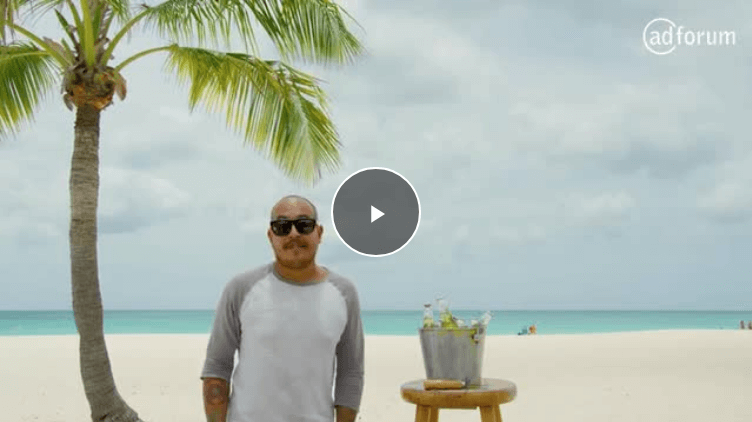 The Arubans seamlessly integrated into the promotion of their island…and they loved it! Actually, as the campaign is primarily digital, we’re able to follow and measure engagement at every level. We’re seeing tremendous engagement on our content that unearths local gems and gives people new ways to explore Aruba. That’s where we’re headed…more experiences, more hidden gems and even more locals. If you could go anywhere right now, where would you go? Why and have you been there before? There are actually two islands where I’d love to be right now. Iceland. I’ve been there a few times and it is life changing. An unbelievable stimulation for all the senses. The other is, of course, Aruba! Picture perfect beaches, crystal blue waters and the warmest people on earth!